Incidental history: what happens while all the famous stuff is going on. The minutiae of real, living breathing, vital life which ripples in great rivers beneath the skeleton of dates and events our historians have created. It is only dry bone, you see, the stuff in the history books. It is the past petrified, and we fantasise about it and build castles in the air and long beyond anything to have seen the great people of each time and their motivation. We lionise the great storytellers who seem to bring the sleeping corpse to life once more. But in fact, the great river of human life flowed on through all these dry dates, and we know only the tiniest eddy of what happened back then. Just occasionally we are allowed to glimpse the living sinew of time. Just the shadow of it, understand; but it moves for an instant before disappearing back into the ancient stones. A recipe for seeing a ripple in the fabric of time. 1. Report to a cathedral. I like Winchester; Exeter is extraordinary. You want a cathedral that is not preened. It must be a warts-and-all cathedral, anywhere in the world. 2. If they ask you to make a donation, I advise you to do so. We do not want one of the few repositories of the ripples of time to fall down around our ears. These places must be respected and kept standing. Though never manicured. 3. Go for a walk with new eyes. This is not as difficult as it seems. The trick is Misdirection: a form of deception in which the attention of an audience is focused on one thing in order to distract its attention from another. The guides will show you the great, grand old clock, the resting place of a great and good, the place the martyr was assassinated. For our purposes, none of this matters. We must alter our perspectives like the old ‘magic eye’ books. Look at the stuff they don’t tell you to look at. The writing on the walls. 1578. Elizabeth I is firmly on the throne. The year kicks off with the Spanish thrashing the Netherlands, and in May Martin Frobisher sets sail from England back to Canada and Frobisher Bay, holding the first ever Thanksgiving by Europeans in North America in Newfoundland.Frances Drake sails through the Strait of Magellan in The Golden Hind; in Scotland, the Clan Macleod are victorious over the MacDonalds of Uist. 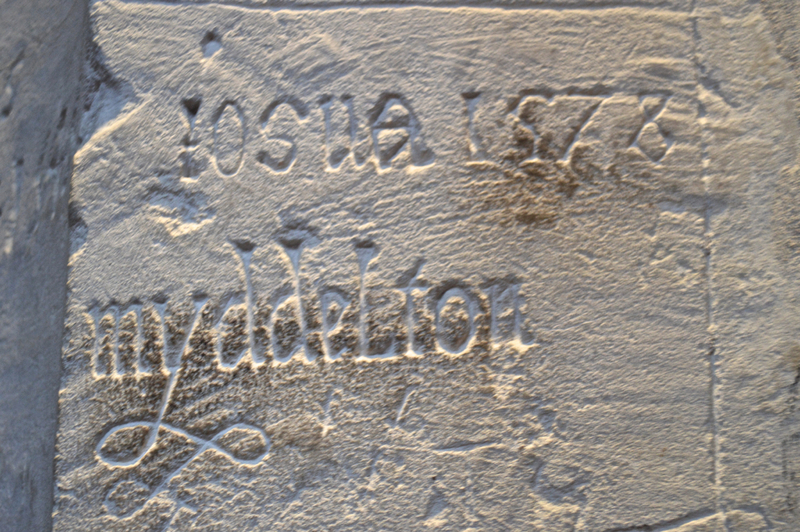 And in Winchester, England, Joshua Myddleton makes an elaborate mark on a cathedral pillar. Cathedrals, they were different then. It was a great market place, a gathering where you could come with your livestock and your dog and Uncle Tom Cobbly and All, and pass the time of day with the rest of the town. It would have been a racket, and I wonder if anyone noticed Joshua’s determined contribution to the waters of time? 1629: Around 350 puritans sail from England to the Massechusets Bay Colony. Charles I dissolves parliament for the next 11 years. A Dutch East India company ship is wrecked off Beacon Island, Western Australia, and the only two survivors – exiled murderers – become the first Europeans to settle in Australia. Emperor Go-Mizunoo of Japan abdicates the throne in favour of his daughter, who becomes Empress Meisho. 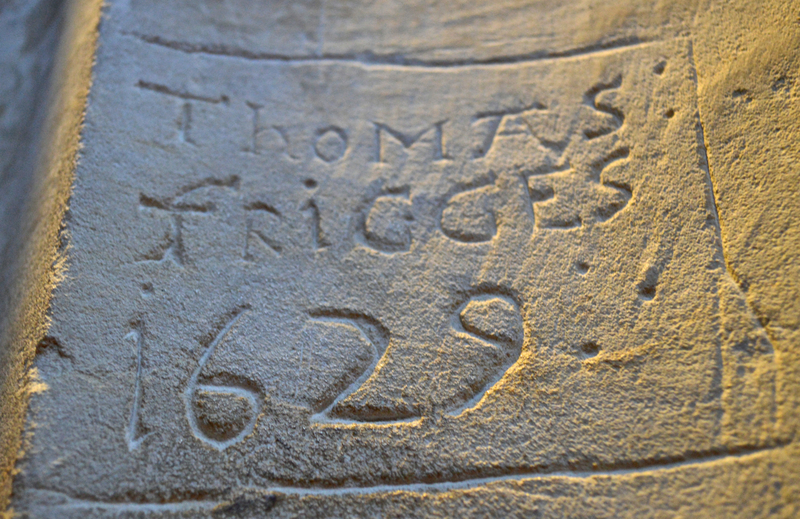 But how much Thomas Frigges knew about all of that, I simply cannot say. He spent a concentrated spell in Winchester cathedral, carving out an identity to puzzle us all in the 21st century. And that’s the sort of thing that happens while all the famous stuff is going on. The minutiae of real, living breathing, vital life ripples in great rivers beneath the skeleton of dates and events our historians have created. This is the history I’d like to know about, Kate. I’ve said it before, but to be able to touch something that links to way back when and for the events to be replayed somehow would fascinate me. Me too, Tom. Of course it may be that someone has already uncovered more about these two people who carved their names.I just love the evidence that small, human things were part and parcel of the history of that time. Little insignificances. Details of biographies we might never know. Evidence of people just like us. The refurbished building I worked in, used to be a school, (1750’s – 1900’s ish) and my favourite smoking spot was a blocked up old door arch. Here, scores of young minds had scraped their initials and signs into the brickwork. It was a great place to stand, imbibing the marks of youngsters from old East London marking out their territory whilst awaiting the doors to open on their future. Great post. Nicely researched. thanks. Have you read any of Edward Rutherford’s series? I just read his 1000 page “novel” set in London on the banks of the Thames which shares the minutiae of daily life by following the threads of 5 families over 2000 years. Quite an ambitious undertaking with good results. He’s done corresponding histories for Russka, Paris, Ireland, Sarum (Stonehenge) and New York. I read it, and Sarum too….but the others haven’t come my way. Sarum creaked a bit, but overall was fine and i very much enjoyed London. Thanks, Helen. I enjoyed seeing “real people” set in a 2000-year-long timeline. I loved this post. Can you tell us more about the market at the cathedral? Also, were you aware that, in the 12th C., students and their professor would gather around the altar at University to get their lessons? Students often treated the altar as a bar as well, drinking and gambling on it much to the anger of the Bishop. Posts of common folk are sometimes more interesting than that of the ‘Rich and Shameless’… The clothes aren’t as sumptuous, though. I think that’s one of the best uses of a guided tour. To stand at the edge, facing away from the crown and look at the place as though you were there with the peons so many centuries ago. Lovely advice. I always enjoy a tour with you. Winchester remains one of my favourite parts. History and variety galore. I didn’t get round to mural squiggles, though. Ahhhh, the incidentals, Kate.These little moments that make time. You always amaze me, me across-the-pond friend, and give me pause.